The fields of Terrinoth will soon know the restless tramp of warring armies, as the Daqan Lords take up arms to battle the encroaching threat of Waiqar’s undying legions. The great battles of this war will not be decided by small groups of individuals, setting on the battlefield by chance, but by massive blocks of trained warriors, fighting and maneuvering as one. In Runewars Miniatures Game, you have the chance to command one of these armies and lead your forces to victory on the field of battle. Still, you need to make sure your troops are properly equipped when it’s time to launch a flanking attack or a volley of arrows. To that end, Fantasy Flight Games is proud to announce the Runewars Miniatures Game Dice Pack! Your set of custom dice is essential to claiming victory during a game of Runewars. After all, you may be able to maneuver and wheel your troops perfectly into position, but you’ll want to have your dice close at hand when it’s time to attack. 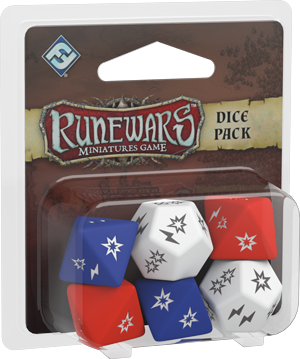 The Runewars Miniatures Game Dice Pack offers you a tool of convenience: another set of custom attack dice, identical to the set that you receive in the Runewars Core Set. When you’ve added the dice in this Dice Pack to your dice from the Core Set, it’ll be easier than ever to keep your focus where it belongs—on the deeply tactical movements and combats of Runewars Miniatures Game. You can expect to learn much more about Runewars, its dice, and the game’s fast-paced unit-to-unit combat in future previews on our website. Until then, prepare to gather your forces, and look for this Dice Pack to release alongside Runewars Miniatures Game in the first quarter of 2017!